let’s pretend all this rice is already cooked ok? I remember how the lid of my grandmother’s butter dish would clang as I removed the top and let my knife sink into the achingly soft stick of Land o’ Lakes (salted). That creamy goodness quickly melted into the pile of snowy white grains, steaming hot from the stove. So I ask you, is there anything better than a bowl of buttered rice? BAH Note: This IS a lot of rice. But the point is to portion it into smaller servings and stash them in the freezer. 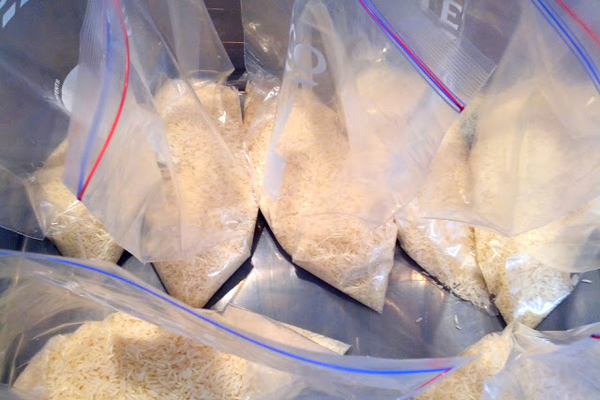 I divided the cooked, cooled rice into 1 cup portions, put them into sandwich size plastic bags (rolled out all the air), and then froze them. Reheating was easy…I added maybe 1 tablespoon of water to my dish and microwaved until the rice was hot and steaming. Heat the oven to 350 degrees. Give the rice a quick rinse in a strainer while you melt the butter over medium heat in an oven safe pot. Add the rice to your pot and stir to coat the rice with the butter. Once the rice starts to smell a bit toasted, add the water and salt to the rice and bring to a boil. Cover tightly with foil or a lid and bake for 20 minutes. Remove from the oven and let the pot sit, covered, for another 10 minutes before digging in.